Living in a state of anxiety may be the new normal, uncertainty seems to pervade every aspect of our lives. Fears of losing our jobs, (or not finding one), frayed personal relationships, tainted foods and medicines, terrorists, pirates, and a thousand other worries are heaped onto a life already moving at a hectic pace. This constant level of anxiety takes a toll, on both a physical and emotional level. For some, the fears become so overwhelming and out of control that they succumb to panic attacks. 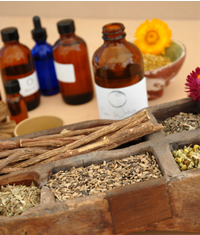 There are many herbal remedies that can support relaxation and help us regain balance. Herbal teas: For cases of mild to moderate anxiety take an herbal tea break (and skip the coffee). These soothing and nourishing herbal tea blends are safe and effective for mild to moderate anxiety and nervous stress. Oatstraw and chamomile are two of my favorite teas to unwind the day. Tinctures Tinctures are an easy way to incorporate herbs into your daily routine and allow for more exacting doses. Alcohol and glycerin can release certain herbal properties from plants that don't extract as well in water. California poppy is an example of anti-anxiety herb that works better as a tincture than a tea. Adding a few drops of tincture to your cup of hot herbal tea helps ensure you are getting a fuller spectrum of an herbs properties, and the heat helps to dispel the alcohol. Avena (oatstraw) is used in tincture form for convenience and more precise dosing needs than the tea provides. Glycerites are liquid herbal extracts that use vegetable glycerin as the extraction menstruum instead of alcohol. You can combine avena with chamomile extracts to ease anxiety and depression, or with other nerve tonics. The sweet taste of glycerine based extracts makes them a favorite for childrens remedies. Bath Herbs for anxiety: Soaking in a hot tub of water works wonders on body and soul. The addition of herbs and oils turns a routine bath into a luxurious spa experience. The heat of the water releases the relaxing and rejuvenating scent of aromatic herbs in fragarent steam. Create you own bath blends using calming anti-anxiety herbs that are both aromatic and healing to the skin.